When I write – especially poetry – I always seek to use “power verbs” wherever possible. It’s never, “I was angry.” I’d wait for words like froth, seethe, frizzle, clench, etc. to come to me. After listening to a TED talk while out on a walk today, I recognize that verb tense – especially the subjunctive – can wield great emotional power. 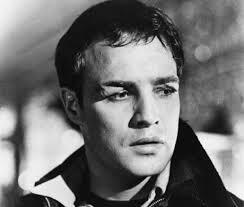 Think of the line, “I coulda been a contender.” Sure, Brando’s intense delivery iconized it. But imagine that same line if it had been written, “I was never a contender,” or “I wasn’t a contender,” or “I never saw myself as a contender.” Even tripping from Brando’s lips, they don’t have the same power. There’s no wistfulness, no regret, no loss, no ‘what might have been’. That emotion all comes from the world “could” (the subjunctive tense) in there. In the TED talk, I learned there are many languages that have no subjunctive and it likely influences those cultures and their beliefs. Since we (English-speakers) do have the woulda-coulda-shoulda, what has that done to us? I wonder if I were to keep my thoughts in simple tenses, will it affect my ability to stay present? Ha! pun.